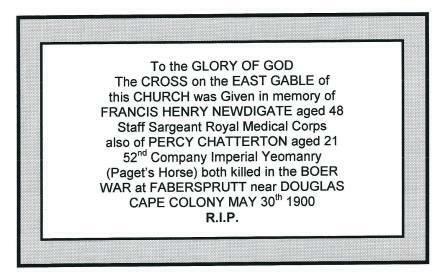 A marble plaque and memorial cross commemorates the lives of two men who lost their lives during the Boer War on the same day, 30th May 1900, at Faberspruit (Faber Sprott), Cape Colony, South Africa. William Henry and Caroline (née Duffie) Newdigate. On the 1st February 1890 William married Katharine Caroline Barrington, daughter of Hon. years old when he was killed in action. Katherine died on 9 August 1936. Battalion, Imperial Yeomanry (Paget's Horse). Percy was 21 years old when he was killed in action. on UK Censuses or Birth Indices, so maybe, like Francis above, he was also born in South Africa. 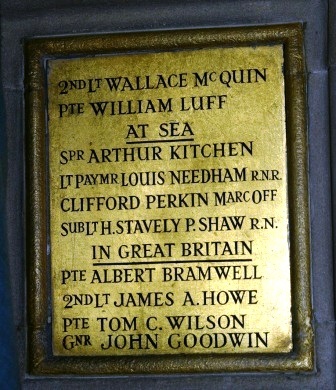 However, quite why the Memorial to these two men is in St John's Church has not been established. 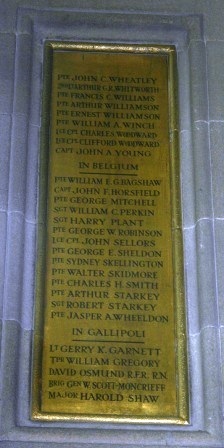 Neither name appears on the town Boer War Memorial in Buxton Town Hall. White's Gazetteer and General Directory of “Sheffield and 20 miles round”, 1862: "The Church (St. John) is at Lower Buxton, in Fairfield township. It is a handsome structure, in the Tuscan order, and was erected in 1812. The east front has large columns which support a massive pediment, and on the west is raised a beautiful tower, which is seen for a considerable distance." 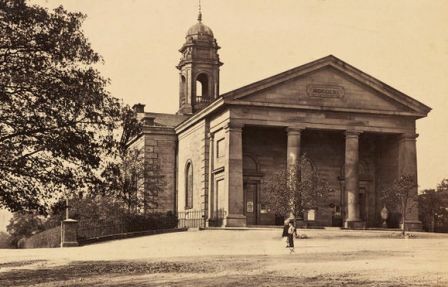 In fact the Church was opened on the 9th August 1812. 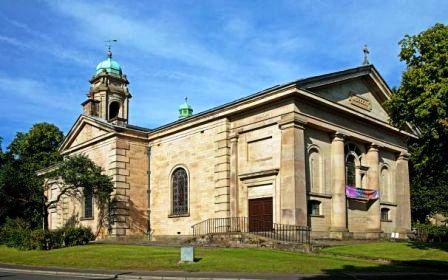 The date on the pediment is 'MDCCCXI' (1811), when St John the Baptist Church replaced the old parochial chapel of 1625, now St Anne, but was then dedicated to St John the Evangelist. Until 1898 Buxton was a chapelry of Bakewell. In 1905, Fernilee and part of Fairfield, previously in the parish of Hope were added, but since the 1970s it has been united with Burbage and King Sterndale. 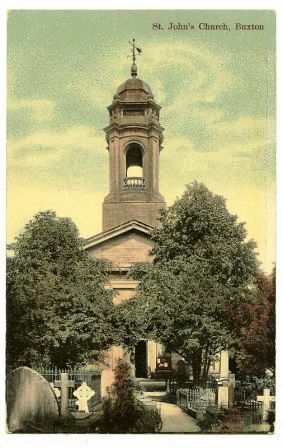 The postcard on the right shows the newly opened entrance on the western end of the Church - still the entrance today . The same image also shows the graveyard in front of the Church entrance, but, as stated above, the churchyard was not accepting new burials by 1912, so no World War 1 casualties are buried there. By 1914, the church was virtually as we see it today, apart from the south transept. The memorial window was added after the First World War. N.B. 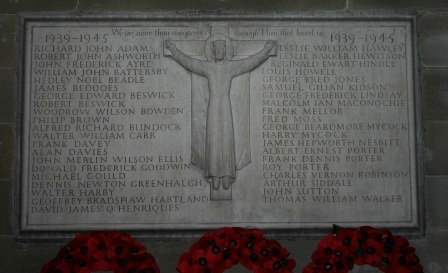 Read more about "The History of St John the Baptist, Buxton"
[f] Lt. W. L. Brown and Lt. C. A. 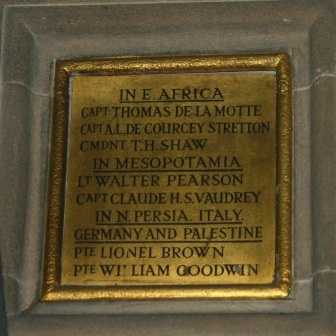 Brown - Memorial Plaque to brothers killed in World War 1. 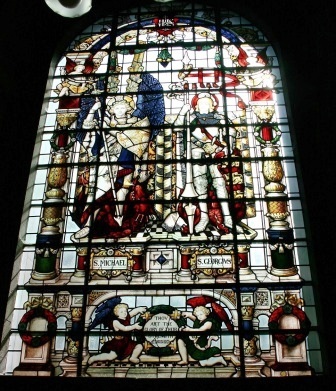 The main World War 1 Memorial in St John the Baptist's Church is a stained glass window, dating from 1926, depicting St George, Christ and Mary, in the Chapel of St Michael and St George [also know as 'The Lady Chapel']. On stone panels either side of the window, and with an inscription at the bottom, are the 98 names of the war dead, on gold leaf engraved in black. The chapel is separated from the main body of the Church by an oak screen surmounted by a mourning figure, unveiled in 1937. 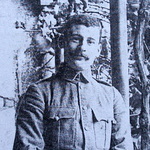 LT PAYMR LOUIS NEEDHAM R.N.R. SUB LT H. STAVELY P. SHAW R.N. Either side of the Memorial Window are six gold panels bearing the names of 98 men of the Parish, who gave their lives in The Great War. They are divided into the various 'Theatres of War' and within these subdivisions, in alphabetical order, including rank. 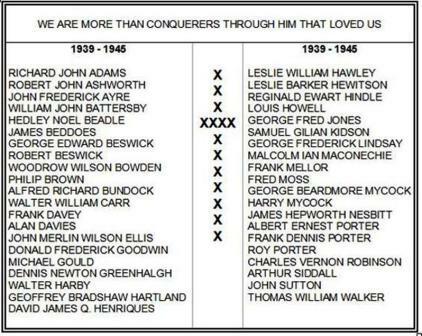 All but 6 of the names listed also appear on the Memorial on The Slopes, Buxton, and some on other Memorials around the town. The Service Records for the other 92 men can be accessed via the alphabetical name index at the top of the page. Capt. 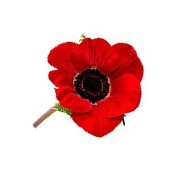 Donald ROBINSON - [not found] There is a Lt. Donald Robinson, 15th Bn. West Yorks Regiment, who was k.i.a. 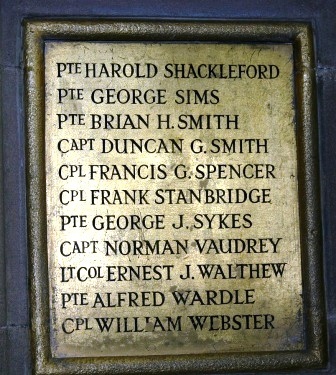 on 3 May 1917, but his family was based in Sheffield and no link to Buxton can be found. After the Second World War a rectangular white limestone tablet with Crucifix at the centre and an incised inscription, measuring approximately 60 cm high and 90 cm wide, was placed on the on the back wall of the St Michael and St George Chapel (Lady Chapel) . It bears the names of 41 Second World War dead and shows both the surname and forename of each casualty. were among the fallen was placed in the Church. those who fell in that conflict. Regiment of each of the School's War dead. 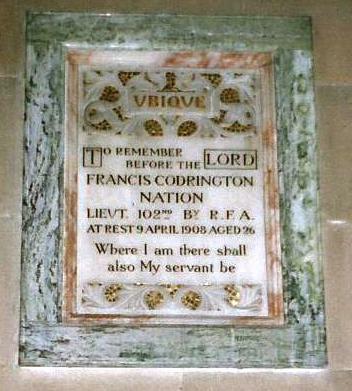 A marble decorated wall plaque, engraved in incised black lettering, is located on the north wall of the north transept, commemorating Lieutenant Francis Codrington NATION, 102nd Battalion, Royal Field Artillery, "At Rest" 9th April 1908, aged 26. 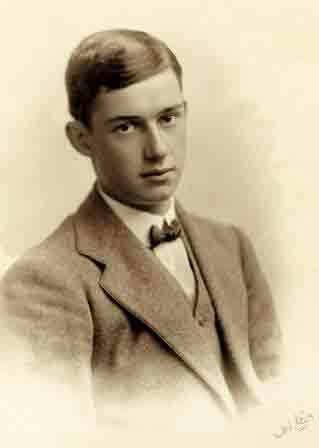 Francis was born in Pontefract, Yorkshire, on the 2nd March 1882, the son of Rev. Charles Codrington and Magdalene Altha (née Cummings) Nation. In 1891 (Census RG 12/2331) 9 year old Francis was boarding at Elmsdale School, Great Malvern, Worcestershire. The 1901 Census (RG 13/1015) shows him as a 2/Lieut, R.F.A. and a 'Boarder' at the Hilsea Barracks, Cosham, Hampshire. Francis married Marjorie Dixon in the December quarter 1901, in Macclesfield, Cheshire. They had one son, Kenneth Dixon Codrington Nation, and a daughter, Pamela. N.B. Francis' father - Rev. Charles Codrington Nation - was the brother of Frances Mary Emily Nation. With her first husband, Rev. Reginald Henry Barnes, she was the mother of Violet Barnes who was an actress under the name Violet Vanbrugh; Irene BARNES, a more famous actress, acted as Irene Vanbrugh (married in Buxton by her Uncle Charles NATION); Sir Kenneth Barnes (Director of RADA); and Sir 'Reggie' Barnes. KCB, DSO, who had what they call a "distinguished Army career" serving with the 19th Hussars in both the Boer and Great Wars. Francis' father was Vicar of Buxton, taking up his incumbency in 1893, hence the Memorial Plaque in the Church. He was still in post until 1911 (Census RG 14/21243). The gates currently at the entrance to the Church from St John's Road, are a Memorial to the Rev. Charles Nation. His son, Francis, died on the 9th April 1908 and his death was registered in Devonport. "At the inquest at Devonport Military Hospital, into the death from burning of Lieut. F. Nation, R.A., it was stated that the unfortunate sufferer was running enveloped in flame, when Major Tennant shouted to him to lie down and roll, which he did. The Major had picked up a blanket, and this he wrapped round Lieut. Nation, who was carried to the officers' mess, and had the burns dressed. Lieut. Nation was understood to say that something went wrong with oil stove when he was taking it from tent. Since then an order had been issued that no stoves will permitted tents. The medical evidence shewed that there a possibility of recovery, but Lieut. Nation's condition took an unfavourable turn, and died from shock, due to burns. A verdict accordingly was returned. The remains of Lieut. Nation were removed from Devonport to Chelford, Cheshire, with full Military honours, wreaths including one from the officers of the 102nd Battery. " 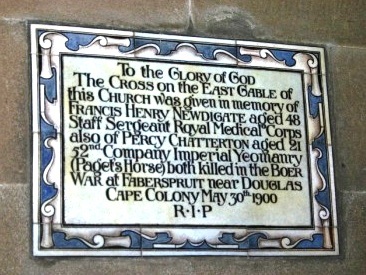 Francis was buried in Chelford on 13th April, his body having been sent by train from Plymouth on 11th April. It was escorted to the station in Plymouth with full military honours. No doubt he was buried in the churchyard there. 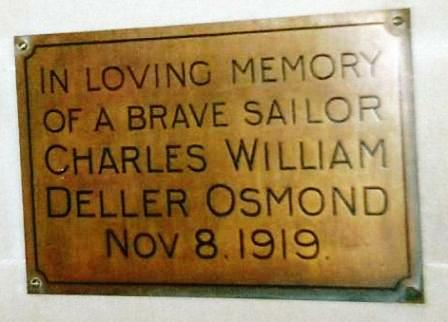 A Brass plaque, commemorating Able Seaman 226286 Charles William Dellor OSMOND, H.M.S. 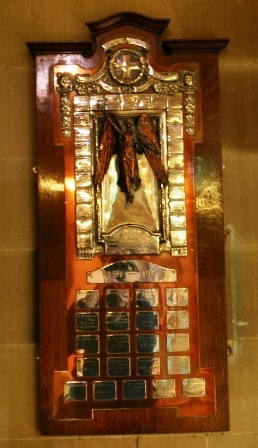 Victory, engraved in black incised lettering, is mounted on the South wall to the rear of the nave. Charles was the son of Walter and Charlotte Osmond of Grange Rd., Buxton, and died on the 8th November 1919, aged 32. He is buried in Grave 2082, Buxton Cemetery. 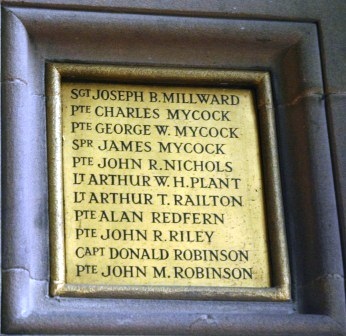 On rear south wall of nave of the Church is a grey marble wall plaque, inset with white marble, engraved in incised black lettering, to the Memory of two Buxton Officer brothers who gave their lives in The Great War. Both served together in the same 6th Battalion and Brass badges of their Sherwood Forester Regiment are attached to each side of the Memorial. The brothers were the sons of Major Abraham (Solicitor) and Lucie Brown, of 20 Hardwick Street, Buxton. William was killed in action on the 25th September 1915, aged 23, and Cecil on the 23rd April 1917, also aged 23. 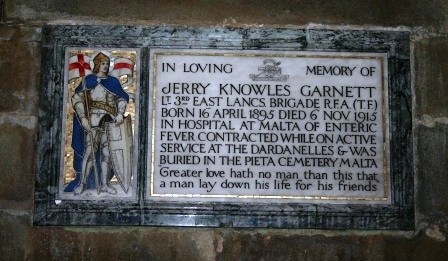 On north wall at rear of nave is a marble decorated wall plaque, inset with mosaic of St George, engraved in incised black lettering, to commemorate Lt Jerry Knowles GARNETT, Royal Field Artillery, 3rd East Lancs Brigade, who died, in Hospital on Malta, on the 6th November 1915, aged 20. In her book, "Testament Of Youth", Vera Brittain describes visiting his grave and sending a flower back to his parents. 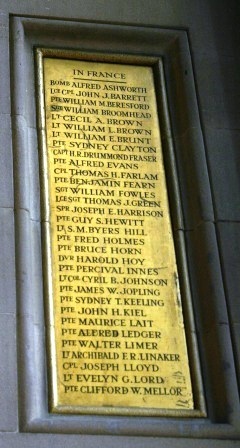 Jerry Garnett was a close friend of Vera's brother, Captain Edward Harold Brittain, who is also commemorated on this site. BURIED IN THE PIETA CEMETERY MALTA. A MAN LAY DOWN HIS LIFE FOR HIS FRIENDS." FOR TRUTH AND JUSTICE THESE UNGRUDGING PAID THE PRICE R. I. P.